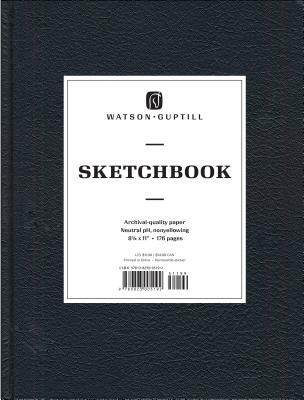 The classic Watson-Guptill Sketchbook, first created by artists for artists, was released in 1993 and has since earned a strong reputation among recreational and professional artists for its durability, lay-flat binding, and premium pH neutral paper pages that are ideal for a variety of drawing media, from pencil and charcoal to pen and ink. Committed artists are increasingly attracted to the utility and enduring qualities that distinquish the Watson-Guptill Large Sketchbook including the sturdy hardcover binding that stands up to daily use and abuse, and the removable sticker. Founded in 1937, and now part of Ten Speed Press, Watson-Guptill has a storied legacy of publishing influential illustrated art books. They seek out respected authorities who instruct and inspire artists in a wide range of art and craft. Their list covers both fine art and practical art instruction in traditional disciplines such as drawing, painting, sculpture, and printmaking, with standout authors like Juliette Aristides of the Atelier series and Rudy De Reyna, author of How to Draw What You See. They also publish modern books focused on artistic pursuits such as craft, collage, mixed media, comics, sequential art, cartooning, manga, and animation, written by such authorities as Burne Hogarth, Stan Lee, Brian Michael Bendis, Camilla D’Errico, and Chris Hart. Watson-Guptill books are found on the shelves of both amateur and professional artists around the world. "I have been an artist, who keeps a sketchbook, for over 20 years. This is without a doubt the BEST sketchbook you can buy. I have found that this sketchbook has beautiful paper, not too toothy or textured, but the cover and binding are the really exquisite part. This sketchbook goes everywhere with me and goes into and out of my backpack every day. I have never had another brand stand up to that kind of abuse and use. This sketchbook looks, after a year, like it did the day I bought it."